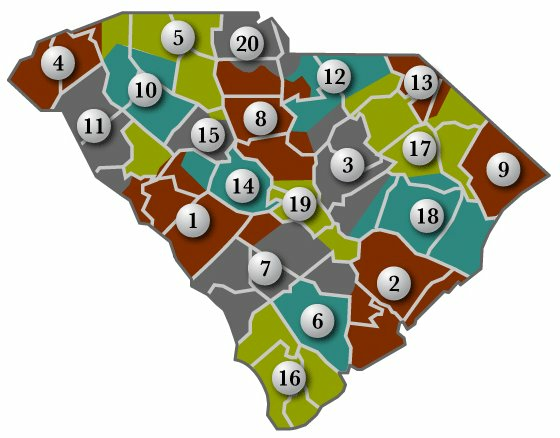 Counties Served: Aiken, Barnwell, Calhoun, Edgefield, Greenwood, Lexington, McCormick, Orangeburg and Saluda. Counties Served: Cherokee, Newberry, Spartanburg and Union, S.C.; Cleveland, Polk and Rutherfordton, N.C.
Telephone: 803-749-6555 or 888-813-9000 in S.C. Counties served: Central is a generation and transmission cooperative (G&T) that is a wholesale power supplier to 16 cooperatives. It does not serve retail consumers. Counties served: New Horizon is a generation and transmission (G&T) cooperative that is a wholesale power provider to five distribution cooperatives. It does not serve retail customers. Counties Served: CEE-US is a material supply cooperative from which other cooperatives purchase electric system construction materials such as wire, poles and transformers.